Last time I talked about how functional a combat patrolling rucksack the Large ALICE pack was as issued. But at the same time it also certainly falls well short of being my idea of the perfect solution. So I’m going to cover some of the most common and useful tweaks, tune ups and upgrades that can be applied to make the pack itself better. I am limited in my visual aids for this portion since my personal ALICE packs only have a small number of bag modifications. Over the years I had experimented with some of the other options but I settled on those which were most useful for my needs and mission. This is definitely an area in which personal preference and your mission parameters will drive your decisions. If you live near a larger Military base there will likely be local sew shops that can do a professional grade job for you. Right now I think Tactical Tailor is the only place that provides Nation-wide mail in sewing service. I’m going to start with two additions that are probably the most universally useful. The first is the mounting of fastex buckles on the exterior pockets and the two long cinch straps. This is also probably the most common upgrade and makes getting in and out of the pack much easier. Not expensive and well worth the money. The Army probably would have put fastex on ALICE by the 90s if the emphasis had not been on replacing it with a new system. Instead we continued to purchase the metal buckle version until the contract eventually lapsed. The second addition is a carrying handle. Without a carrying handle people tend to grab the ALICE by the envelop pad and rip it loose. We used to fabricate handles out of 550 cord or better yet 1” tubular nylon and attach it to the top of the frame. Later those sew shops I mentioned stated putting even better webbing handles directly onto the bag itself for their customers. With ALICE, the one handle on top got the job dome. The Large MOLLE II also has a sewn in handle and the USMC’s FILBE even comes with handles on the sides as well. Let’s talk about pockets. There are a number of high quality ALICE clones that come with 8-10-12 pocket options. Or you can have that many sewn onto your USGI ALICE pack. If you need that many pockets I say go for it. But if you want more pockets because you “want to carry more stuff”, I’d say think again. I would recommend adding only enough pockets to move critical or frequent use items from the interior to the exterior of your pack. I eventually settled on a total of five pockets. Two claymore pockets, one on the back and one on top as shown. A small pocket on top that I kept a survival kit in and two long hydration pockets which I had sewn on the inside on either side of the bag. It behooves you to keep the profile of your pack – any pack – in all dimensions as small as you can manage. And it is especially desirable if at all possible not to expand the flanks of the pack out much wider than your shoulders. Sleeping bag extensions are a fairly popular option. I haven’t seen the need myself but then again I have not been working in extremely frigid environments for many years. A light bag and a bivy have been enough for my needs and didn’t take up enough space to justify the extension. However, if you expect or need to carry the full military sleep system or civilian equivalent then it would be worth it. And much better than strapping your sleeping bag underneath the pack. Or burying your sleeping gear at the bottom of the pack so that you have to unload everything to get to it. 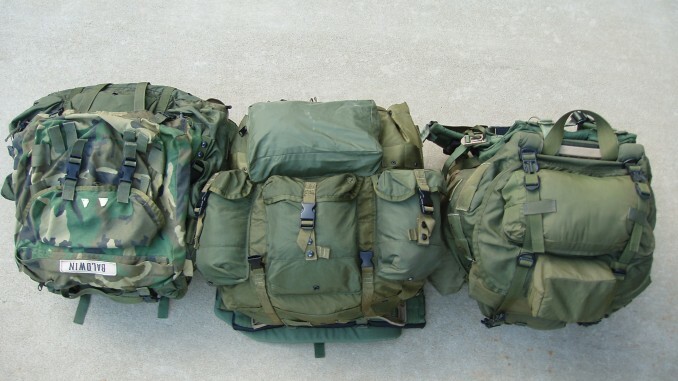 As readers may recall, the first generation of MOLLE was actually a two part system with main pack and a separate sleeping system carrier that could be strapped underneath. The MOLLE II combined the two and has a crescent shaped zippered opening on the bottom quarter for separate access to a sleeping bag. The FILBE has a similar arrangement. Adding straps to secure 2-Quart Canteens and E-Tools to the sides of the ALICE (or MOLLE for that matter) is also helpful. I used these for many years and recommend them if you are routinely carrying those items. Besides providing additional security these straps keep the items from flopping around when moving. While I was in the infantry I used one of each. In Special Forces it was two of the 2-Quarts since I had much less use for an E-tool. Then eventually I transitioned to Camelbaks carried inside as I already mentioned. PALS webbing or panels are not as common a modification. But they are something that Tactical Tailor offers for the sides of the ALICE or their MALICE version. This will allow you to add MOLLE type pouches to the outside of the pack. As with the directly sewn on pockets I would caution anyone not to add pockets that are not essential for your mission. Storm collars are common on most top loading rucksacks today, even the smallest. It is a useful modification to consider applying to your ALICE. All of the long packs I spoke of in Part 1 had storm collars. Oddly, the Large MOLLE I & II did not initially come with one. However, the latest version of MOLLE does now have a storm collar as does FILBE. Side compression straps are also common on most packs today whether side or top loaders. However, this has not been a very popular modification for ALICE packs. Partly because you can compress the ALICE down pretty small with the main pack straps. And perhaps also because many people chose to add pockets on the sides instead. MOLLE II had 2 compression straps per side but now comes with 3 per side. FILBE has 2 per side. RTO zippers are an excellent mission enhancing alteration for any RTO or anyone carrying a larger radio. I tried it myself on one of my packs years ago. Not because I was performing RTO duties, but because I wanted quick access to the radio pouch inside. I used to keep star clusters, parachute flares and smoke grenades in there. That worked pretty well. Later, I added the claymore pouch on top and moved my pyrotechnics there. And that worked even better. As with storm collars, MOLLE did not have RTO zippers until the latest iteration was fielded. FILBR also has a zipper. Likewise, the addition of antenna or hydration tube ports has gained in popularity over the years. Primarily because more and more people started to carry hydration bladders in their packs as well as considerably more electronic gear. A note of caution here. As I mentioned earlier I settled on only a handful of the options that I considered mission enhancing. If you think you need to apply most or ALL of these adjustments to get the pack you want. Then I would say the USGI ALICE is not the rucksack you need to be spending your money on. Look at commercial clones or other quality manufacturer’s products instead. Piggyback assault packs. For many years I have used the Patrol Pack from the CFP 90 (top left) as what I always called my “actions on the objective pack”. Not to carry more of my stuff. Rather, I used it to collect what we now call SSE material off an objective or prisoner. Otherwise it remained mostly empty but there if I needed it. It was common in the 90s and early 2000s for SFQC candidates to carry a variety of small after-market packs on top of their ALICE for similar purposes. I guess that is considered outdated TTP now. The SPEAR pack came with what could only be described as a full-fledged 3-Day pack that was supposed to ride on the back of the main pack. MOLLE II came with a somewhat more reasonably sized Assault Pack. The problem is that today each of these small(er) packs are usually filled to capacity. And are always additive to the weight and bulk of the main pack’s load. Load planning and load discipline may need to be a separate topic for another day but I will touch on it now. There was a time when we didn’t have so many options and we organized our gear in three discrete echelons. The fighting load which involved only two ammo pouches for magazines and grenades, two canteens and maybe a buttpack with poncho and a meal. In the rucksack was the existence load which was mission essential gear: comms, ammo, water and some environmental clothing (wet weather and / or cold weather) and minimum sleep gear. Items “common to all” as we used to say. Everything else went into the duffel bag or kit bag to be delivered later because those items were NOT mission essential. I know that is an old school SOP and even then was violated on a regular basis. But the fact is we’ve long ago lost sight of load planning fundamentals. Now, everything and the kitchen sink has migrated onto the soldiers’ backs. Just in case. We’ve added the significant weight of body armor and we’ve removed nothing. And instead of addressing the problem we keep making the packs bigger! There is no commonsense in that and no sound tactical reason to allow that to happen. I have included a fairly famous photo of a hard charging paratrooper from the 173d ABCT after the jump on an airfield not far from Irbil in Northern Iraq. Note that he is heavily overburdened. The irony is there was no compelling need for his leaders to load him up that way. He jumped onto an airfield already secured by Kurdish Peshmerga and US Special Forces. An airfield where US aircraft had already been airlanding in the nights prior. An airfield that additional US aircraft continued to utilize almost immediately after the jump, exactly as planned. So why did this soldier’s chain of command think he needed to carry all of this stuff on his back during the initial insertion? I don’t know. But I will tell you it is just one example of bad load planning and failed load discipline that was a daily occurrence for US Forces in Iraq and Afghanistan. And we damn well know better. We just can’t seem to muster the collective will to reverse this trend and actually manage the soldiers load. In the end, it’s not about what style of pack we issue, it is about leadership.